Even Vladimir Putin calls Trump a bad liar in 'SNL' cold open. "Yesterday we all made Donald Trump the 45th President of the United States," Vladimir Putin (Beck Bennett) announced in a mock paid message from the Russian Federation on SNL last night. "Hooray, we did it!" 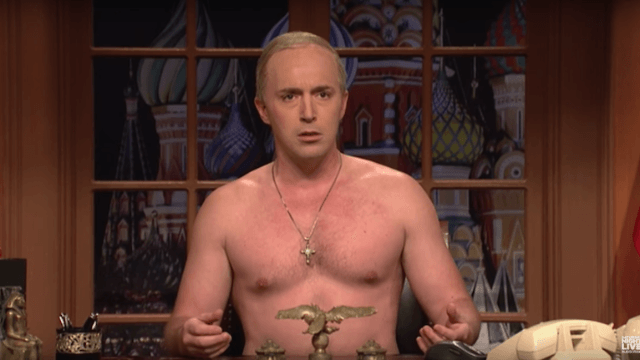 Now that it's an accepted fact that Russia hacked the election, SNL has made their Putin character more brazen than ever, as he overtly points out that he aided in electing Donald Trump. Putin then goes on to address Trump directly in his statement, and explain to him that he needs to tone down his lies (like saying that 1 million people came to his inauguration), with this great piece of advice: "say that you are friends with Lebron James, don't say that you are Lebron James." Putin tried to comfort Americans by showing them how well he treats Russian citizens, by bringing on a terrified Russian lady (Kate McKinnon) who was clearly reading her positive review of Russian quality of life from a script. What's scary is that living in a place where citizens fear criticizing their leader doesn't feel too far off. The way that Trump lashes out at any ounce of criticism or negative ratings on Twitter is absolutely something to be nervous about. But in the past two days there have been instances in which members of Trump's cabinet have completely denied facts, including Sean Spicer saying that Trump's inauguration was the best attended in history, and Kellyanne Conway supporting him by saying he was using "alternative facts," whatever that means. Even scarier, perhaps, is that The Interior Department, after retweeting two different tweets about inauguration attendance that seemed anti-Trump, had its Twitter account shut down. And while the joke about living under Putin feels like a bit of a jab at the innocent people living in the country, the sketch managed to punch up. At the very end, the scared Russian citizen reappears in the background, from behind Putin. At first she seems afraid, but then she pulls on a pink "p*ssy" hat and signals that she's watching his every move. That's right, Trump, the people are always watching.